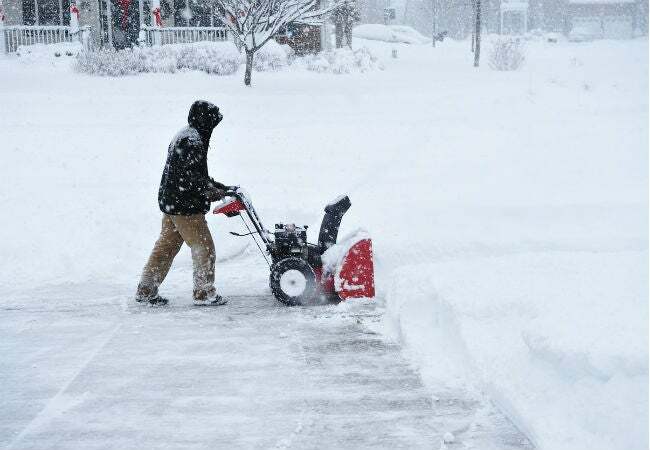 Try these DIY troubleshooters before the next storm to get your snow blower going again. Q: After our first snow of the season, I got the snow blower out of the shed but the darn thing wouldn’t start. It ran fine the last time I used it, about nine months ago. Any tips or tricks to get it running again myself, or do I have to take it in for service? 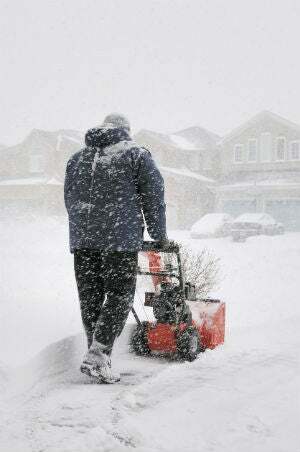 A: Like all motorized equipment, snow blowers require periodic maintenance in order to operate efficiently. Yet because yours ran well when you last used it, there’s a good chance the problem is something minor that you can fix yourself. Before trying the troubleshooters below to fix a snow blower that won’t start, pull out your owner’s manual (or download a copy from the manufacturer’s website). 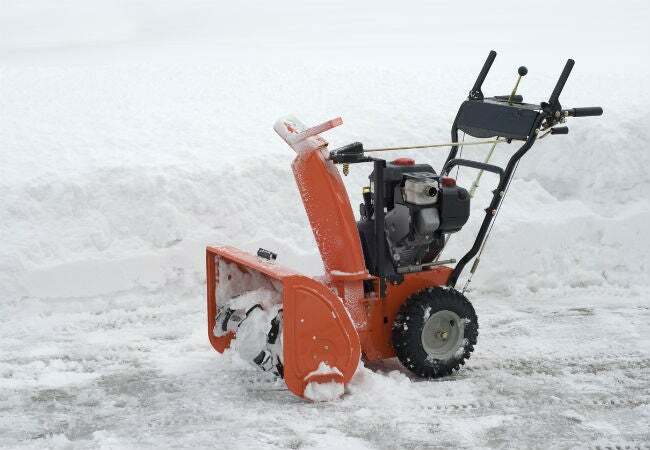 While virtually all snow blowers feature the same components—valves, filters, gas tanks, carburetors, fuel lines, and switches—their configurations vary by brand, so the manual will help you locate and identify them. All tools required can be found in any auto-supply store if you don’t already have them on hand. Make sure all switches and valves are in the correct starting position. Today’s snow blowers have many switches, buttons, and valves that must all be in the correct position for the machine to start. Your manual may call for the throttle to be in the “High” position, the fuel shut-off valve in the “Open” position, the choke in the “Full” position, and the run switch set to “On.” Some snow blowers even use images instead of words. Check to make sure all of switches and valves are set according to the manufacturer’s specifications, or else your snow blower won’t start. Drain and replace old gas in the tank. Since your snow blower has sat idle for months, the gas could easily have developed gummy residue, which can make starting the machine difficult. Siphon out the old stuff with a small siphon pump, and follow these steps for how to dispose of the gasoline. Then, fill the tank with fresh gas and try starting it again. Add fuel stabilizer to the gas tank. Even if you’ve drained and refilled the gas tank, residue from the old gas could be clogging the carburetor. To dissolve it, try adding fuel stabilizer, a gasoline treatment product that helps liquefy residue. Add it to the snow blower’s gas tank at the rate specified on the container, and then try to start the machine. Even if it doesn’t immediately start, keep cranking (by pulling the starter cord repeatedly) to help work fresh fuel and stabilizer through the carburetor. If the snow blower won’t start up, wait an hour or two to allow the fuel stabilizer more time to dissolve residue, and then try again. Prime the engine to force fuel into the carburetor. Gas engines are often slower to start in cold weather (precisely when you need your blower! ), so your next move is to give it a little boost of fuel. First, prime the engine by pressing the flexible primer bulb, a small rubber or silicone bulb located on your snow blower near the carburetor, three to five times. This will force a small amount of fuel into the carburetor where it can more easily ignite. Immediately after priming, try to start the blower. Since it hasn’t been operated for months, it could take three or our attempts before it kicks on. Clean or replace the spark plugs. Three things must be present in order for your snow blower to run correctly: fresh fuel, the proper amount of compression in the engine, and a spark to ignite the fuel. So cleaning or replacing the spark plugs could do the trick. Use a socket wrench and a spark plug socket to remove the plugs. Once they’re out, inspect the porcelain sleeves for cracks. If you find a crack, replace the plug with a new one. Clean built-up carbon deposits from the electrodes (on the threaded end of the plug) with commercial plug cleaner or carburetor cleaner and a wire brush. Dry the plugs and reinsert them. If the snow blower won’t start even after your tinkering, the plugs may be shot beyond repair and should be replaced. Examine the fuel line for damage. The fuel line, which runs from the gas tank to the carburetor, should be flexible and pliable. Over time, fuel lines can harden, and a brittle line is prone to leaking fuel, either from a crack or around the connections where it meets the gas tank and the carburetor. A leak can prevent fuel from reaching the carburetor and keep the snow blower from starting. If the line is hard, cracked, or kinked, replace it with a new one. Clean the carburetor. If none of the above steps have gotten your snow blower going, you may need to clean the carburetor more aggressively to dissolve gunk and residue. A carburetor’s purpose is to combine air and fuel in a precise ratio for efficient combustion, so if it’s clogged with residue it can’t do its job. Check your owner’s manual for instructions on how to access the carburetor, located beneath the air filter. After removing the air filter cover and the air filter, you’ll be looking at the carburetor (a metal case with a cylindrical opening). Carb cleaner is a solvent that comes in an aerosol can with a straw that fits on the nozzle to deliver a forceful shot of gunk-dissolving spray directly into the carburetor. Where the air filter was connected to the carburetor, you’ll see an open cylindrical valve—this is the air-intake valve. Spray the carb cleaner inside the air-intake valve (instructions on the can will specify how much to use). Replace the air filter and filter cover and then try to start the snow blower. Call a service technician. No luck? Troubleshooting beyond this point may require dissembling parts of the machine. If your snow blower is still under warranty, contact the manufacturer or the store where you bought it for instructions on how to proceed. If it’s an older machine, take it to a small engine repair shop; stores that sell lawn mowers, snow blowers, rototillers, and other small equipment often also offer repair and maintenance services. Having a service technician repair your snower blower could run anywhere between $75 and $300—sometimes as much as it would cost to replace it with a budget-friendly pick—depending on the extent of the problem. If repair estimates wind up on the higher end of that range and your machine has quite a few years on it, now might be the time to upgrade. Check out our buyer’s guide to the best snow blowers on the market for key considerations to choosing your next outdoor tool as well as some top-of-the-line recommendations.